Air ducts are vital part of a home. We specialize in ensuring that airflow in your home is reliable and functions properly. Not only is it annoying when a duct stops working or becomes problematic - it can also mean that the air quality in your home drops, and that the house as a result becomes less healthy to live in. As such, it’s important to be aware of what may go wrong with this appliance and know how to spot it in time. One of the easiest faults to identify is a blocked duct or vent. This could be dust building up inside, or something having gotten lodged in the vent by accident, for example by falling on the duct. You may be able to see the blockage yourself if you look into the duct, or it may need specialised equipment to find it. Once identified, though, we can clean it out for you. Air ducts have several parts that fit together in a certain way - and if some of them are not connected properly, you may notice that air doesn’t flow as smoothly or easily through the vent, as the air will leak out at the poor or weak connections. This can also create problems with condensation inside the ceiling. Occasionally, a duct may crack, for example due to improper installation or if the duct is bent. Mostly, this happens accidentally - one cause is that something squeezes the duct. While blockages are fairly easy to identify, cracks and their causes are trickier, and often require professional equipment and expertise to identify. The immediate consequence of a problematic air duct is reduced air flow, whether it’s warm or cold air. The problem may seem insignificant at first, but it will likely get worse over time. You should always take issues with your air ducts seriously and react to them quickly. 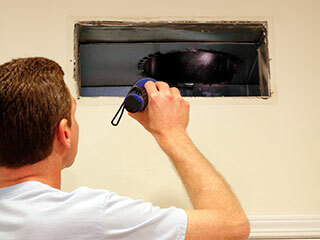 We can help with cleaning, repair, and replacement of air ducts and vents in Sugar Land and the area. We are your local cleaning company, a locally owned and run business that has been around for more than a decade. No matter what kind of air duct cleaning or dryer vent type of service you require, we have the knowledge and equipment to get the job done right the first time, every time. Thank you for choosing Air Duct Cleaning Sugar Land! Until our appointment, check out our website for blogs, tips, FAQs and more!